Assam Handloom and Textile Recruitment 2017 for Jr. Inspector/ Auditor & Demonstrator jobs under Handloom and textile industry in Assam. Assam Handloom and Textile Recruitment 2017 notification about for filling up Grade-III Jr. Inspector/ Auditor & Demonstrator jobs under Directorate of Handloom & textile department Assam (Handloom and textile industry in Assam) for persons with disability in (Special Recruitment Drive) as per Rule. Qualification: Candidates must have Bachelor Degree in Arts/ Science/ Commerce from a recognized University or any examination declared equivalent by the Govt. No of posts: 10 Nos. Qualification: Candidates should be HSLC or equivalent examination passed and 2 years certificate course in Textile Technology or Handloom Technology from any recognized Institute or Certificate Course from the Handloom Training Institutes of the Department of Handloom & Textiles, Assam. Age: 18 to 43 years as on 1st January 2017. However, the upper age limit is relaxable by 5 years in case of SC/ ST category of persons as per Govt. OM No. ABP 06/2016/04, dated 3rd March 2016. Qualified Candidates will be called for written examination and for Viva-Voce Test. Interested and eligible candidates may apply in the prescribed standard form of application along with attested copies of all certificates in support of Educational Qualification, Age, Caste etc + Attested copy of persons with Disability Certificate issued by Competent Authority + Attested copy of valid Registration Certificates of Employment Exchange + One self addressed envelope of 5 cm x 11 cm affixing unused postal stamp of Rs. 5/- only should be reached the following given address within time. The envelope containing the application should be clearly marked as "Application for the post of .................... category- SC/ST/OBC. ''To Handloom & Textiles, Assam, Ambari, G.N.B. Road, Guwahati-1''. Official notification of Assam Handloom and Textile Recruitment 2017. You will be interested in Latest Assam Govt Jobs Alert 2017. DFO Bokakhat Recruitment 2017 Computer Operator & Field Jobs. Electricity Assam Recruitment 2017 Junior Assistant Job Vacancies. 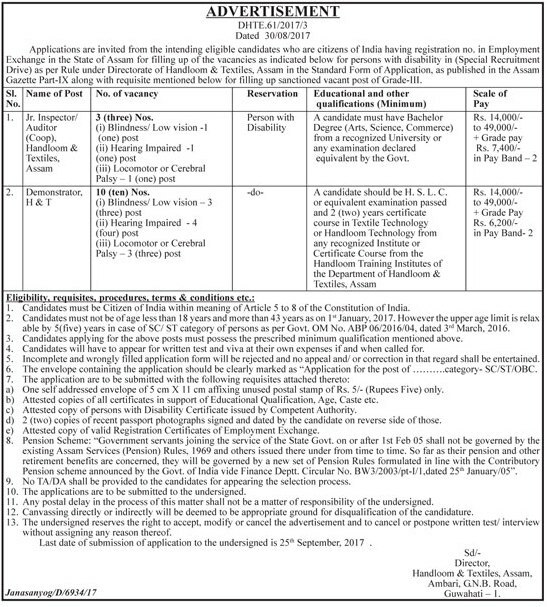 Assam Secretariat Recruitment 2017 Assistant & Operator Jobs. Pension Scheme: "Government servants joining the service of the State Govt. on or after 1st Feb 05 shall not be governed by the existing Assam Services (Pension) Rules, 1969 and others issued there under from time to time. So far as their pension and other retirement benefits are concerned, they will be governed by a new set of Pension Rules formulated in line with the Contributory Pension scheme announced by the Govt. of India vide Finance Deptt. Circular No. BW3/2003/pt-I/1,dated 25th January/05". 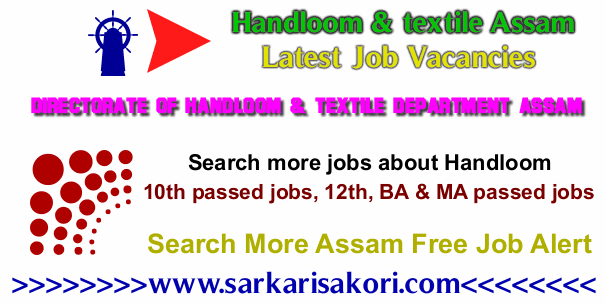 All relevant details regarding Assam Handloom and Textile Recruitment 2017 or Handloom and textile department Assam recruitment 2017 vacancies have given above please check them properly.